Mubychem Group, established in 1976, is the pioneer manufacturer of Zinc Sulphate, Pharmaceutical, Fragrance & Flavor chemicals in India. Mubychem Group has several manufacturing facilities spread across Gujarat and Mumbai India and world wide contacts and toll manufacturers. We are exporting globally to countries like USA, Europe, UAE, South Africa, Tanzania, Kenya, Egypt, Nigeria, Uganda, Turkey, Mexico, Brazil, Chile, Argentina, Dubai, Indonesia etc. 99.0 per cent to 104.0 per cent Zinc Sulphate Heptahydrate ( Zinc Sulfate Heptahydrate ). B. Solution S gives the reaction of zinc. 4.4 to 5.6 for solution S.
99.0 per cent to 104.0 per cent Zinc Sulphate Hexahydrate ( Zinc Sulfate Hexahydrate ). White or almost white, crystalline powder or colourless transparent crystals, efflorescent. 99.0 per cent to 101.0 per cent. White or almost white, crystalline powder, or colourless, transparent crystals. Very soluble in water, practically insoluble in ethanol (96 per cent). Dissolve 2.5 g in carbon dioxide-free water R and dilute to 50 ml with the same solvent. Sulfuric acid, zinc salt (1:1), hydrate. Zinc Sulfate contains one or seven molecules of water of hydration. The monohydrate contains not less than 89.0 percent and not more than 90.4 percent of ZnSO4, corresponding to not less than 99.0 percent and not more than 100.5 percent of ZnSO4·H2O, and the heptahydrate contains not less than 55.6 percent and not more than 61.0 percent of ZnSO4, corresponding to not less than 99.0 percent and not more than 108.7 percent of ZnSO4·7H2O. Identification— A solution of it responds to the tests for Zinc and for Sulfate. Acidity— A solution containing the equivalent of 28 mg of ZnSO4 per mL is not colored pink by methyl orange TS. Arsenic— the limit is 14 ppm. Lead— The lead limit is 0.002%. Alkalies and alkaline earths— Dissolve the equivalent of 1.12 g of ZnSO4 in about 150 mL of water contained in a 200-mL volumetric flask. Precipitate the zinc completely by means of ammonium sulfide TS, and dilute with water to volume. Mix, and filter through a dry filter, rejecting the first portion of the filtrate. To 100 mL of the subsequent filtrate add a few drops of sulfuric acid, evaporate to dryness in a tarred dish, and ignite: the weight of the residue does not exceed 5 mg (0.9%). 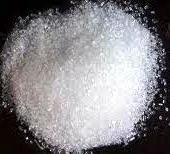 Zinc Sulfate occurs as colorless, transparent prisms or small needles, or as a granular, crystalline powder. It contains one or seven molecules of water of hydration. The monohydrate loses water at temperatures above 238°; the heptahydrate effloresces in dry air at room temperature. Its solutions are acid to litmus. The monohydrate is soluble in water and practically insoluble in alcohol. One gram of the heptahydrate dissolves in about 0.6 mL of water and in about 2.5 mL of glycerin; it is insoluble in alcohol. Identification: A 1:20 aqueous solution gives positive tests for Zinc and for Sulfate. Assay: Monohydrate: Not less than 98.0% and not more than 100.5% of ZnSO4·H2O; Heptahydrate: Not less than 99.0% and not more than 108.7% of ZnSO4·7H2O. Alkalies and Alkaline Earths: Not more than 0.5%. Cadmium: Not more than 2 mg/kg. Mercury: Not more than 5 mg/kg.